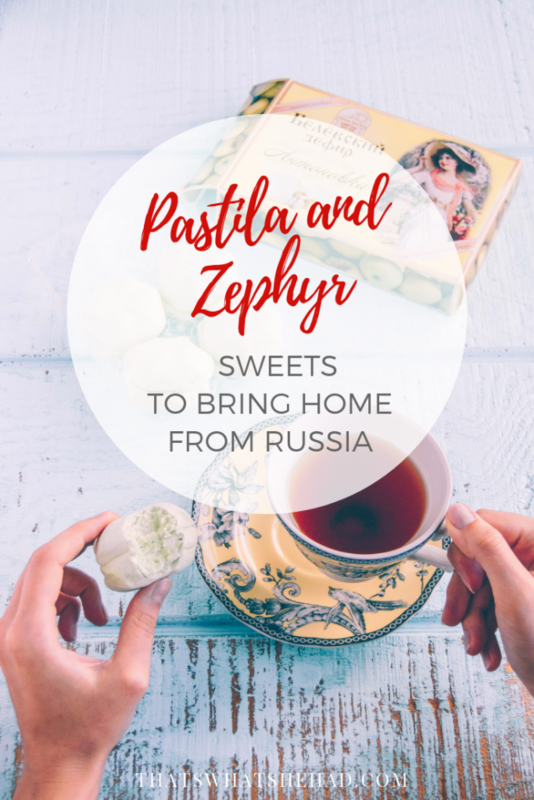 This post wouldn’t be written if it wasn’t for my mother’s big love of pastila and zephyr. No cookies, chocolates, cakes, or pies can compare to pastila in my mom’s Universe. She only wishes other people could understand and share her love. 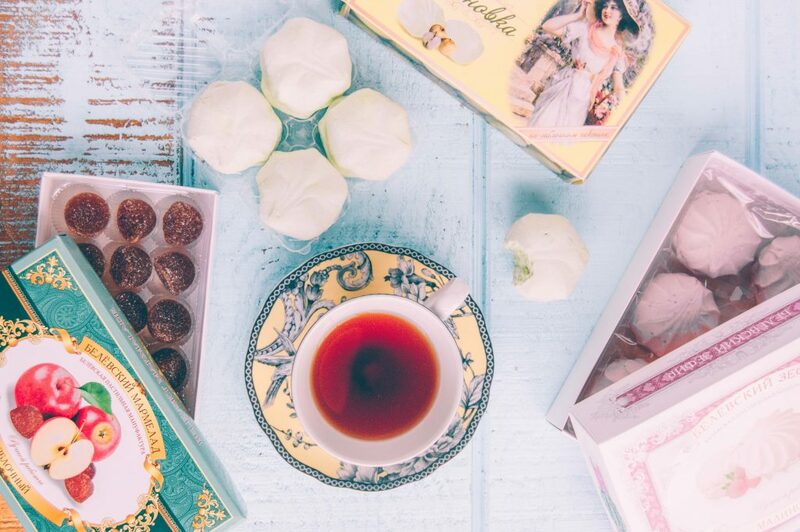 So when it comes to sending Russian sweets to beloved daughter across the ocean there’s no question what to choose. Pastila it is! 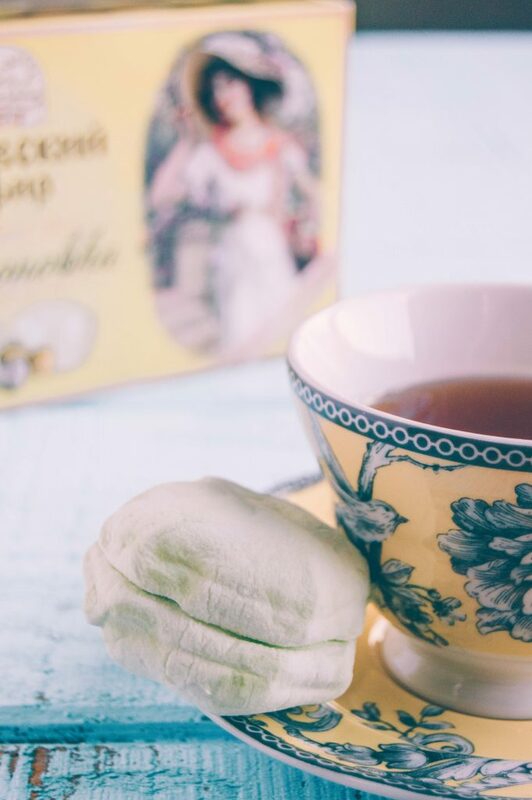 Russian pastila resembles marshmallows in taste and consistency, but is a healthier alternative and has a distinct natural fruity flavor. 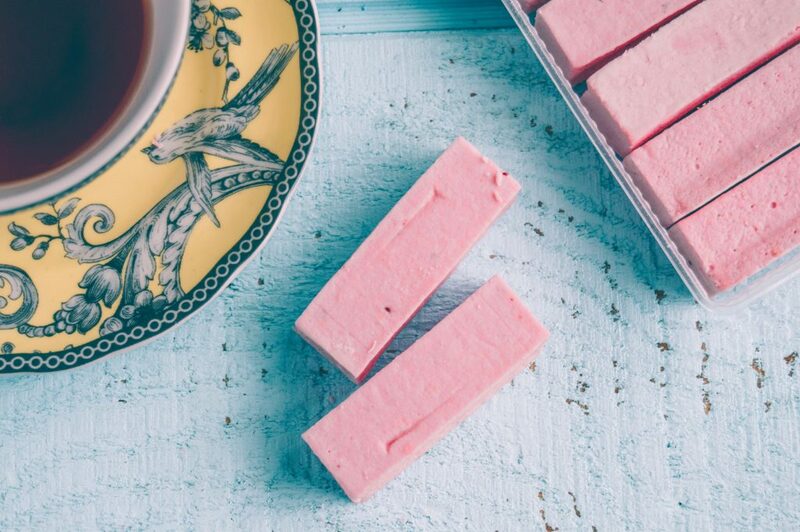 The easiest way to explain what pastila tastes like is to compare it to marshmallow. 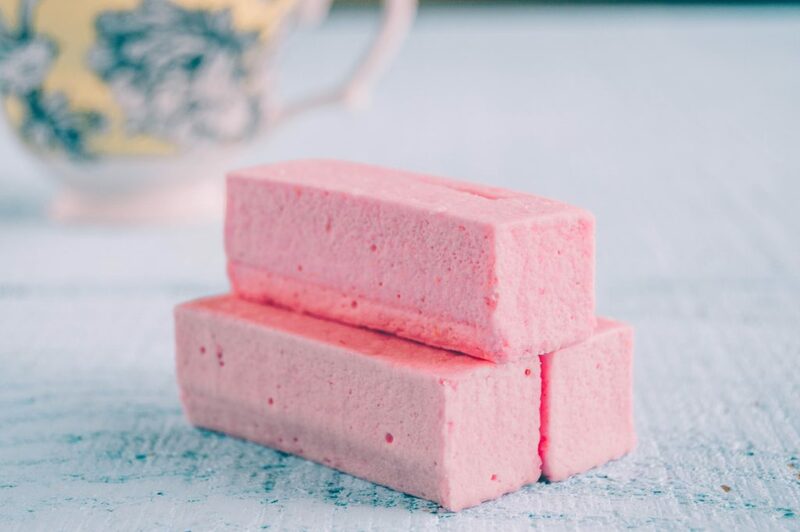 Both are soft and spongy, but marshmallows usually have a more tangy and chewy consistency. Pastila has a rather cloud-like texture: light and airy inside with a slightly crunchy layer on top caused by crystallized sugar. Cranberry pastila from a Russian factory “Udarnitsa”. It has added flavors and isn’t the best one on the market, but sometimes it’s hard to find the real deal. The biggest difference between the two lies in ingredients: marshmallows consist in large part of sugar mixed with water and gelatin (in my experience in USA most of them also have added colors and flavors), while the main ingredient in pastila is apple puree to which egg whites and some sugar is added. So pastila has a very distinct fruity flavor, plus it is a healthier and more natural option. Then of course, not any kind of pastila can pass my mother’s high standards. 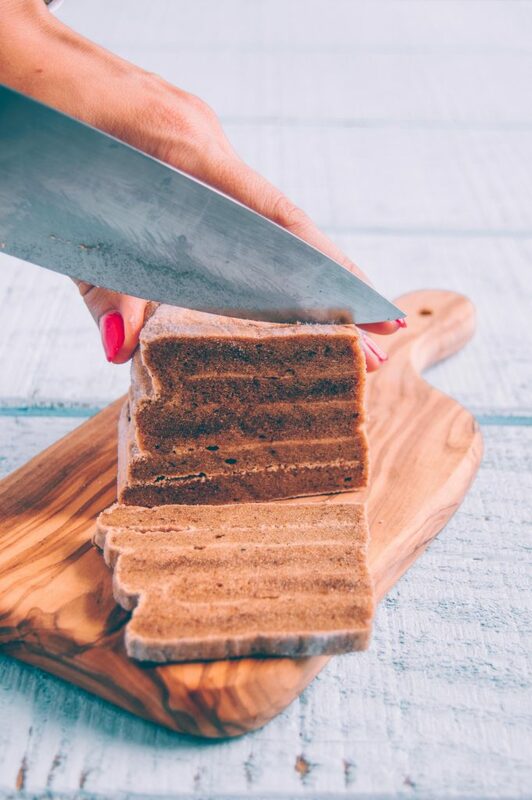 There’s one brand in particular that made the cut and found its way across the Atlantic and straight to my table – Belevsky pastila. Belev is a small town in Tula region of Russia where pastila has been produced since 1888. I even have a fairy-tale story to tell you. Belevsky pastila looks very different from other pastila brands on the Russian market. 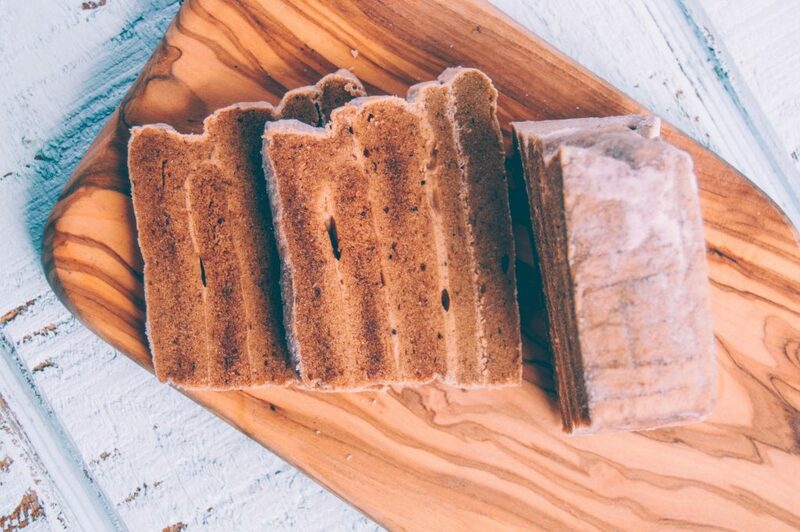 It’s sold in a brick shape that you cut into pieces yourself. Once upon a time there was a Russian merchant called Amvrosiy Prokhorov (don’t bother trying to pronounce it) who lived in town of Belev. His remote ancestor (some 300 years before) received 5000 in silver coins from Emperor Peter the Great and used the money to buy land along Oka River to grow an apple orchard. Baked apples were a common treat in the house. Once, the servants left the apples cooking for too long. To save the batch, somebody suggested adding egg whites and sugar. The mixture was spread out and dried. The resulting sheets were glued together with leftover apple puree mix. And thus Belevsky pastila was born. You can clearly see the sheets of apple mixture, dried and glued together, on this picture. Soon after Amvrosiy Prokhorov established a commercial line producing pastila. Two years later, it won the first prize at Saint-Petersburg gardening exhibition. 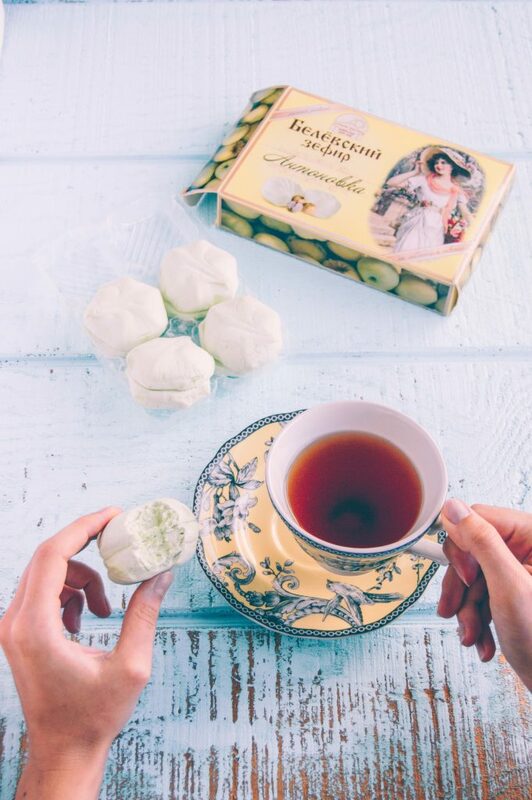 Pastila quickly became a popular treat leading Prokhorov to open shops in Moscow, Saint-Petersburg, Kiev, and Tbilisi. 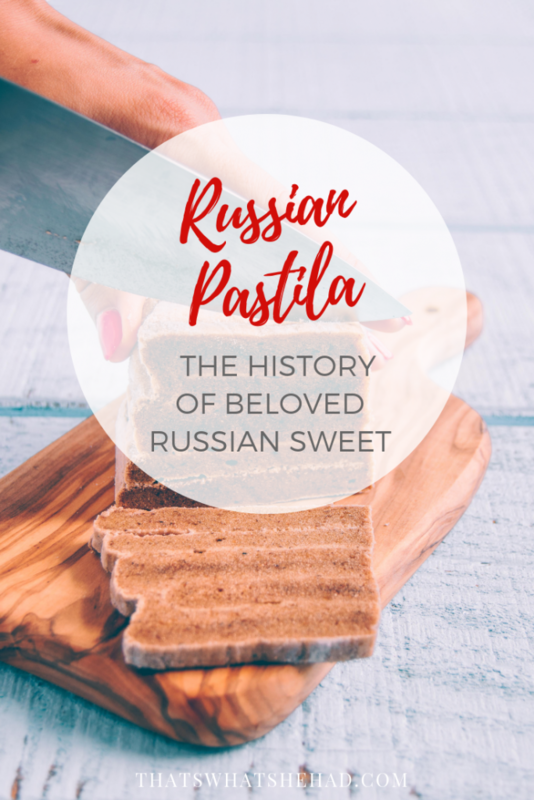 In reality, long before Amvrosiy Prokhorov realized the potential behind this simple treat, pastila was invented in a Russian town of Kolomna. You can still visit Kolomna Pastila Factory museum, located two hours away from Moscow. But it was his Belevsky pastila that became a great success worldwide and found its way to the royal houses of Russia, France, and Spain. By 1950-s most of Belevsky pastila was exported, making it impossible for Soviet people to get the sweet treat. Party officials, though, always had access to the best of the best. Today, the factory still produces pastila using traditional recipe. The only 3 ingredients in classic version are apple puree, egg whites, and sugar. Only one kind of apples, Antonovka, is used in production. No colors or artificial flavors are added. Since apples are naturally full of pectin no other gelling ingredients are required. Nowadays, berries puree is also added to the mixture to have a variety of flavors. Now what on Earth is zephyr? Unlike pastila that was created in Russia, zephyr is a French invention made of similar ingredients. It also consists of apple puree with addition of berries puree, egg whites, and sugar. Since the amount of apple puree is less in zephyr, gelling agents are added. The main difference between pastila and zephyr is in preparation process. The mixture for pastila is spread out and left to dry, the sheets are then glued together and cut into pieces. 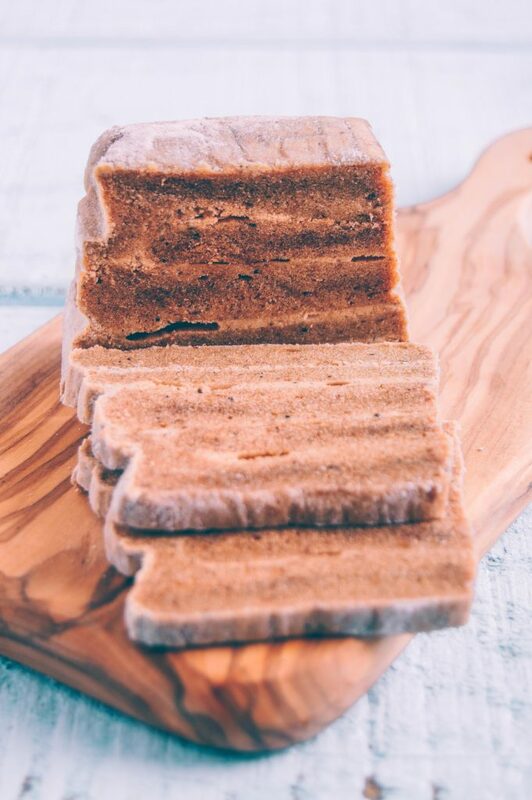 That’s why pastila usually comes in shape of logs (or a brick like in case of Belevsky pastila). Zephyr mixture, on the other hand, is piped into molds and dried. Each mold is meant for half a piece of zephyr. Once the halves are dry, they are glued together to make one whole piece. Two halves of zephyr are glued together to create one piece. On his trip to Austin, my brother had 8 boxes of Belevsky pastila, zephyr, and marmalade in his suitcase (there was also a bottle of Georgian wine, honey from Altay region, and about 15 books in Russian – pretty much no space was left for his belongings). But what happiness it is to receive presents from one’s Motherland! It was, obviously, my mom’s idea to find Belevsky sweets and send to me. But it was my granny who had to run around Moscow in search of the famous brand – it’s not easily found in smaller towns like the one where my family lives. Plus, the treats are quite expensive at 250 rubles a box. For comparison: a loaf of bread costs 20-30 rubles. But it is definitely worth it. 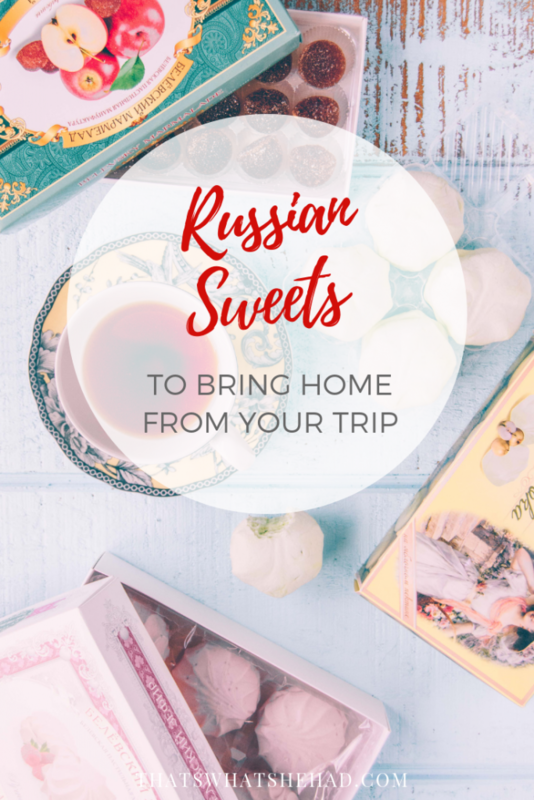 So next time you visit, you know what to bring from Russia with love! Belev factory has 6 signature stores in Moscow. 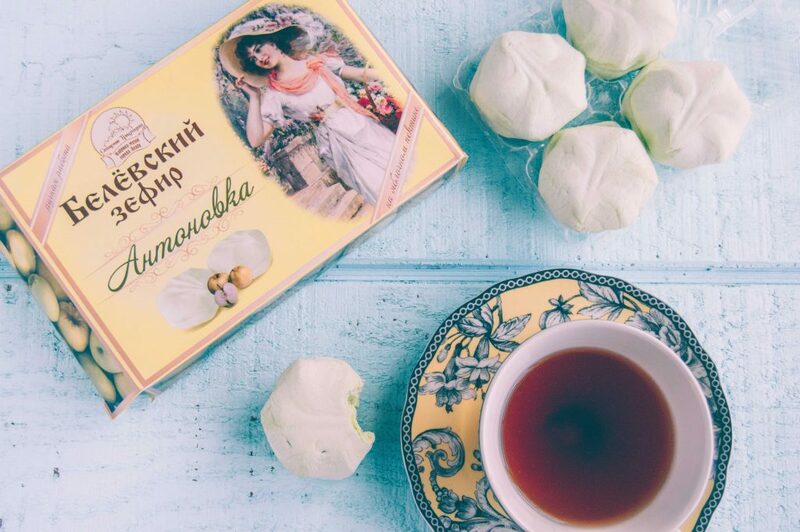 You can also find these Russian sweets in some grocery stores around the country. Also what others would you recommend taking to Sri Lanka from Russia? Thank you Heather! One of the reasons I love pastila so much is that I know it’s healthy and doesn’t have any chemicals, which is important to me. By the way, my brother and I had a deal: he brings me food and books and I send him home with heaps of new clothes 😀 So it was a win-win! I tracked down your pastila post! My husband much prefers both zephyr and marmalad to pastila, truth be told. I am… not actually wildly keen on any of them. I like polyot cake though! True meringue! Interesting perspective. I shall have to track this location/ brand down and compare them to the Kolomna ones! That’s a perfect description of zephyr, Kristina! 🙂 In Russia, they are still pretty popular, nowadays they dip them in chocolate – so good! Wonder why zephyr is not so popular in Lithuania anymore!